1 26 Public Accountability Statement CIBC has been an important part of the Keelan family business for more than 50 years. For third-generation business owner Joyce Keelan, pictured with CIBC Branch Manager Mark McCarthy, CIBC played an integral role in getting her own manufacturing business started and helping it to develop into the thriving enterprise that it is today. Small Business Banking Committed to small business We re committed to delivering an exceptional banking experience to clients. Our holistic approach to delivering financial services is designed to meet the personal and business requirements of entrepreneurs at every stage of business growth. Accessible banking services CIBC branches, ABMs, online and telephone delivery channels provide easy access to daily banking services for clients. Our small business employees provide clients across Canada with advice and service to meet personal and business financial requirements. Meeting specialized needs CIBC meets the specialized needs of small business clients in the agricultural sector and Aboriginal community. Improved access to credit Our newly enhanced fulfilment process for CIBC Small Business Credit Edge has reduced the amount of time it takes for approved clients to access their funds. Encouraging growth CIBC is a strong supporter of programs that encourage entrepreneurship and growth of small businesses. Supporting Small Business Small business is vital to the vibrancy and sustainability of Canada s economy. The rate of growth in the number of entrepreneurs is more than double that of private sector salaried employees. The CIBC Small Business Economic Report, published in September 2004 and entitled Canadian Small Business Back in High Gear, notes that, as of July 2004, the ranks of Canada s self-employed grew to just under 2.5 million and, by the end of the decade, it is expected that one in five Canadians will be self-employed. Two striking developments are the emergence of seniorpreneurs as the fastest growing segment in the small business sector and the unmistakable pattern of small businesses getting smaller. During 2004, small business formation growth has been concentrated among entrepreneurs with fewer than five employees. And, small business owners 55 years and over currently account for one in four self-employed individuals in Canada. Since 2001, the number of organizations run by older Canadians has risen by 140,000 or 30%. CIBC is committed to this dynamic and growing sector. 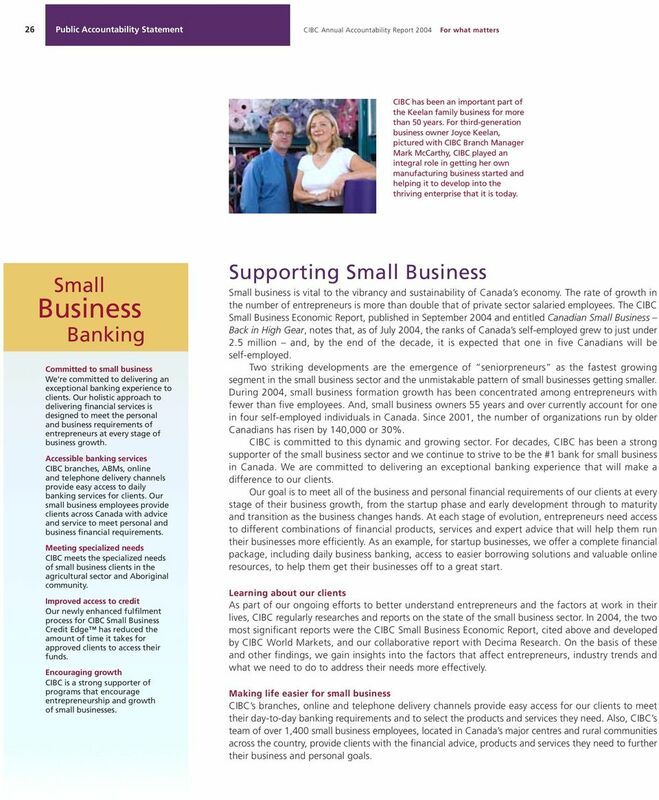 For decades, CIBC has been a strong supporter of the small business sector and we continue to strive to be the #1 bank for small business in Canada. We are committed to delivering an exceptional banking experience that will make a difference to our clients. Our goal is to meet all of the business and personal financial requirements of our clients at every stage of their business growth, from the startup phase and early development through to maturity and transition as the business changes hands. At each stage of evolution, entrepreneurs need access to different combinations of financial products, services and expert advice that will help them run their businesses more efficiently. As an example, for startup businesses, we offer a complete financial package, including daily business banking, access to easier borrowing solutions and valuable online resources, to help them get their businesses off to a great start. 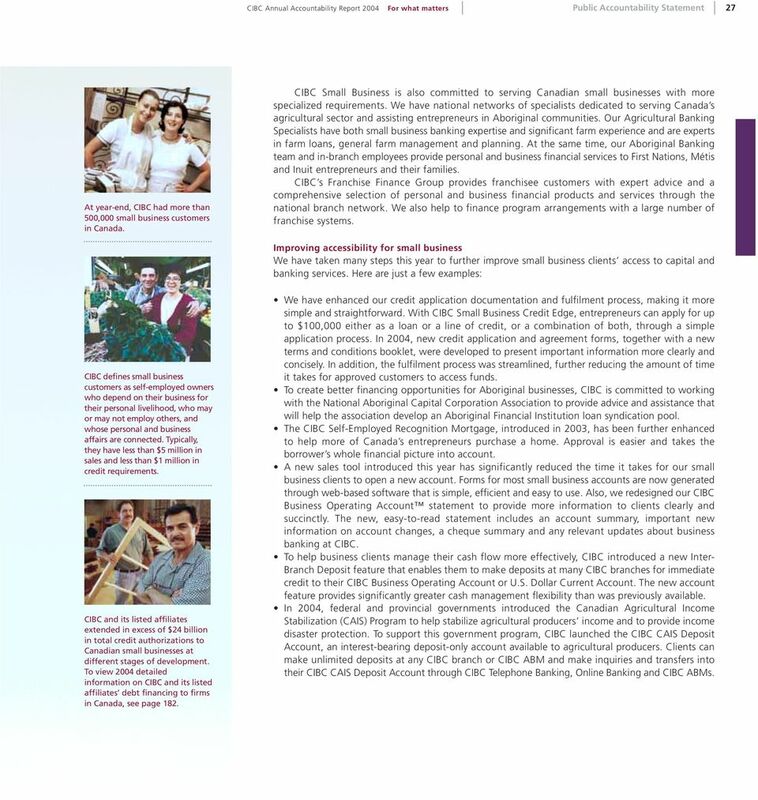 Learning about our clients As part of our ongoing efforts to better understand entrepreneurs and the factors at work in their lives, CIBC regularly researches and reports on the state of the small business sector. In 2004, the two most significant reports were the CIBC Small Business Economic Report, cited above and developed by CIBC World Markets, and our collaborative report with Decima Research. On the basis of these and other findings, we gain insights into the factors that affect entrepreneurs, industry trends and what we need to do to address their needs more effectively. Making life easier for small business CIBC s branches, online and telephone delivery channels provide easy access for our clients to meet their day-to-day banking requirements and to select the products and services they need. Also, CIBC s team of over 1,400 small business employees, located in Canada s major centres and rural communities across the country, provide clients with the financial advice, products and services they need to further their business and personal goals. 2 CIBC Annual Accountability Report 2004 For what matters Public Accountability Statement 27 At year-end, CIBC had more than 500,000 small business customers in Canada. CIBC Small Business is also committed to serving Canadian small businesses with more specialized requirements. We have national networks of specialists dedicated to serving Canada s agricultural sector and assisting entrepreneurs in Aboriginal communities. Our Agricultural Banking Specialists have both small business banking expertise and significant farm experience and are experts in farm loans, general farm management and planning. At the same time, our Aboriginal Banking team and in-branch employees provide personal and business financial services to First Nations, Métis and Inuit entrepreneurs and their families. CIBC s Franchise Finance Group provides franchisee customers with expert advice and a comprehensive selection of personal and business financial products and services through the national branch network. We also help to finance program arrangements with a large number of franchise systems. Improving accessibility for small business We have taken many steps this year to further improve small business clients access to capital and banking services. Here are just a few examples: CIBC defines small business customers as self-employed owners who depend on their business for their personal livelihood, who may or may not employ others, and whose personal and business affairs are connected. Typically, they have less than $5 million in sales and less than $1 million in credit requirements. CIBC and its listed affiliates extended in excess of $24 billion in total credit authorizations to Canadian small businesses at different stages of development. To view 2004 detailed information on CIBC and its listed affiliates debt financing to firms in Canada, see page 182. We have enhanced our credit application documentation and fulfilment process, making it more simple and straightforward. With CIBC Small Business Credit Edge, entrepreneurs can apply for up to $100,000 either as a loan or a line of credit, or a combination of both, through a simple application process. In 2004, new credit application and agreement forms, together with a new terms and conditions booklet, were developed to present important information more clearly and concisely. In addition, the fulfilment process was streamlined, further reducing the amount of time it takes for approved customers to access funds. To create better financing opportunities for Aboriginal businesses, CIBC is committed to working with the National Aboriginal Capital Corporation Association to provide advice and assistance that will help the association develop an Aboriginal Financial Institution loan syndication pool. The CIBC Self-Employed Recognition Mortgage, introduced in 2003, has been further enhanced to help more of Canada s entrepreneurs purchase a home. Approval is easier and takes the borrower s whole financial picture into account. A new sales tool introduced this year has significantly reduced the time it takes for our small business clients to open a new account. Forms for most small business accounts are now generated through web-based software that is simple, efficient and easy to use. 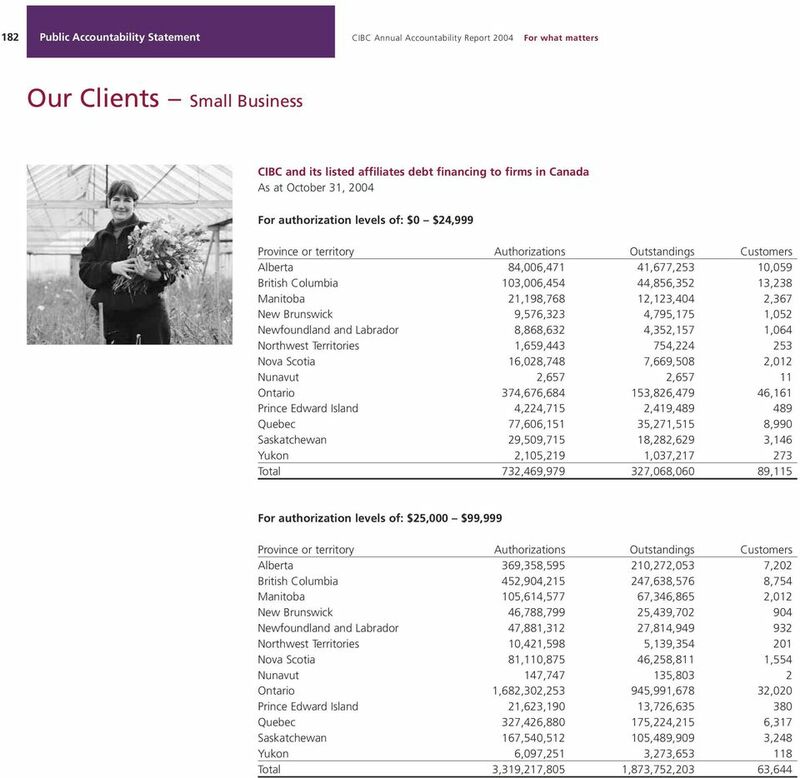 Also, we redesigned our CIBC Business Operating Account statement to provide more information to clients clearly and succinctly. The new, easy-to-read statement includes an account summary, important new information on account changes, a cheque summary and any relevant updates about business banking at CIBC. To help business clients manage their cash flow more effectively, CIBC introduced a new Inter- Branch Deposit feature that enables them to make deposits at many CIBC branches for immediate credit to their CIBC Business Operating Account or U.S. Dollar Current Account. The new account feature provides significantly greater cash management flexibility than was previously available. In 2004, federal and provincial governments introduced the Canadian Agricultural Income Stabilization (CAIS) Program to help stabilize agricultural producers income and to provide income disaster protection. To support this government program, CIBC launched the CIBC CAIS Deposit Account, an interest-bearing deposit-only account available to agricultural producers. Clients can make unlimited deposits at any CIBC branch or CIBC ABM and make inquiries and transfers into their CIBC CAIS Deposit Account through CIBC Telephone Banking, Online Banking and CIBC ABMs. 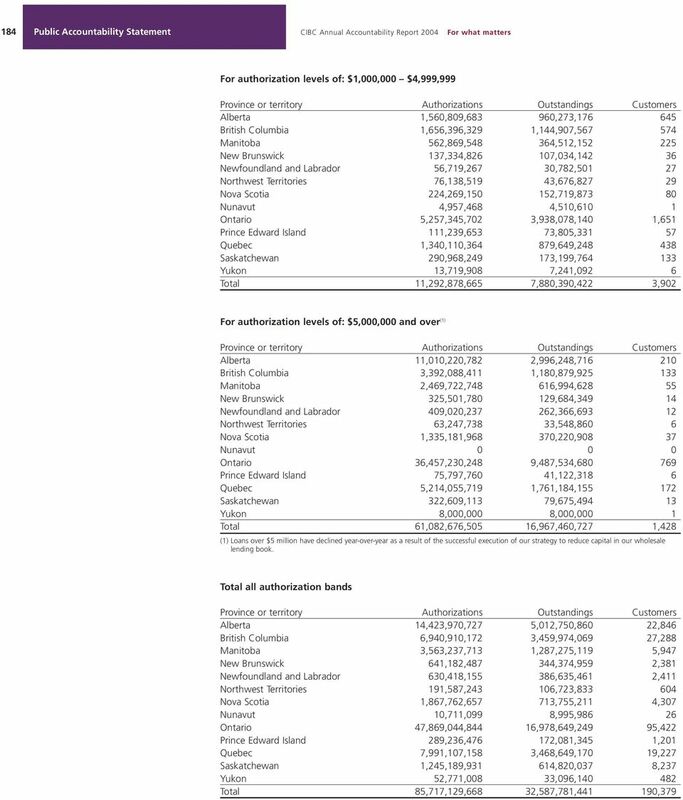 3 28 Public Accountability Statement Borrowing customers with total authorizations under $100, , , ,000 80,000 40, CIBC s small business borrowing customers with total authorizations under $100,000 totalled almost 153,000 in 2004, up from just under 138,000 in the prior year and nearly 111,000 in The CIBC Student Entrepreneur of the Year Award for 2004 was presented to Amanda Harburn of Calgary, founder and operator of Prestige Dance Academy Inc., a full-service dance studio for children and adults. 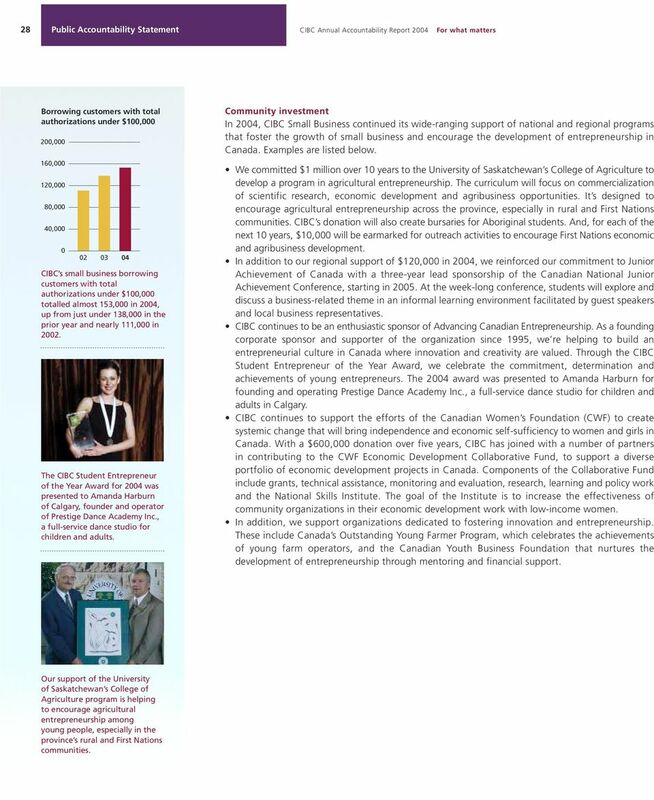 Community investment In 2004, CIBC Small Business continued its wide-ranging support of national and regional programs that foster the growth of small business and encourage the development of entrepreneurship in Canada. Examples are listed below. We committed $1 million over 10 years to the University of Saskatchewan s College of Agriculture to develop a program in agricultural entrepreneurship. The curriculum will focus on commercialization of scientific research, economic development and agribusiness opportunities. It s designed to encourage agricultural entrepreneurship across the province, especially in rural and First Nations communities. CIBC s donation will also create bursaries for Aboriginal students. And, for each of the next 10 years, $10,000 will be earmarked for outreach activities to encourage First Nations economic and agribusiness development. In addition to our regional support of $120,000 in 2004, we reinforced our commitment to Junior Achievement of Canada with a three-year lead sponsorship of the Canadian National Junior Achievement Conference, starting in At the week-long conference, students will explore and discuss a business-related theme in an informal learning environment facilitated by guest speakers and local business representatives. CIBC continues to be an enthusiastic sponsor of Advancing Canadian Entrepreneurship. As a founding corporate sponsor and supporter of the organization since 1995, we re helping to build an entrepreneurial culture in Canada where innovation and creativity are valued. Through the CIBC Student Entrepreneur of the Year Award, we celebrate the commitment, determination and achievements of young entrepreneurs. The 2004 award was presented to Amanda Harburn for founding and operating Prestige Dance Academy Inc., a full-service dance studio for children and adults in Calgary. CIBC continues to support the efforts of the Canadian Women s Foundation (CWF) to create systemic change that will bring independence and economic self-sufficiency to women and girls in Canada. With a $600,000 donation over five years, CIBC has joined with a number of partners in contributing to the CWF Economic Development Collaborative Fund, to support a diverse portfolio of economic development projects in Canada. Components of the Collaborative Fund include grants, technical assistance, monitoring and evaluation, research, learning and policy work and the National Skills Institute. The goal of the Institute is to increase the effectiveness of community organizations in their economic development work with low-income women. In addition, we support organizations dedicated to fostering innovation and entrepreneurship. These include Canada s Outstanding Young Farmer Program, which celebrates the achievements of young farm operators, and the Canadian Youth Business Foundation that nurtures the development of entrepreneurship through mentoring and financial support. Our support of the University of Saskatchewan s College of Agriculture program is helping to encourage agricultural entrepreneurship among young people, especially in the province s rural and First Nations communities. Our Employees. CIBC s vision, mission and values are at the centre of our commitment to create an environment where all of our employees can excel. Investing basics Getting started Canadian Securities Administrators Securities regulators from each province and territory have teamed up to form the Canadian Securities Administrators, or CSA for short.